CoffeeCup Free FTP is a simple and easily navigable FTP client for file uploads and downloads. 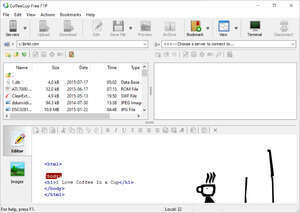 CoffeeCup Free FTP provides you the ability to use an unlimited number of FTP accounts, resume broken downloads, and transfer files in binary, ASCII, or auto-mode. It also offers an optional auto-refresh on each file upload or download, and optional FTP log transcription. Version 4.5.2014 is a freeware program which does not have restrictions and it's free so it doesn't cost anything. For security reasons, you should also check out the CoffeeCup Free FTP download at LO4D.com which includes virus and malware tests. Additional screenshots of this application download may be available, too. CoffeeCup Free FTP has a presence on social networks.